The horrific truths of the brutal killing of several New York Police Officers are once again under the spotlight as Herman Bell, a member of the Black Liberation Army, as well as several other cop-killers, are being issued freedom at the backing of radical-left Democratic Party organizations. To begin, we'll focus on Herman Bell, who alongside two others were sent to prison for the grisly slayings of two officers. Before we go further, it's important to note that the wife of radical racist Black Panther leader, who was imprisoned for murdering two police officers and later freed, was found dead in what is now being labeled as a suicidal free jump to her end her life. 71-year-old Nancy Jacot-Bell married Herman Bell 20 years into his prison sentence from behind bars, in what many have suggested appears as a delusional act by a deranged woman to marry a vile cop-killer. After Bell’s release from prison, he was placed on Community Supervision by the State Board of Corrections, and not allowed to leave the state to move into California where his wife was at. A week after his release from prison, Nancy Jacot-Bell was admitted into a California assisted-living center in Emeryville, where she was purported to have suffered from emotional stress. Then, it was announced by the New York Daily News yesterday that she's now committed suicide by jumping from a fifth-floor window. While some would suggest that's tragic, we're here to discuss Herman Bell and the Black Power agenda which resulted in domestic terrorism and the conviction of those who murdered police officers; as well as the Democratic Party’s effort to defend the cop-killers. The Herman Bell case is one that will forever live on in infamy, as the Black Liberation Army (BLA) radical Black Power organization leader murdered a police officer and was released from prison this year despite the officer's widow pleading with courts to keep her husband's killer behind bars. 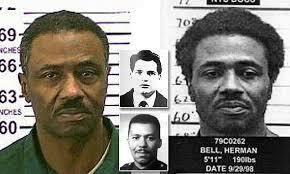 It was forty-seven years again when Herman Bell and two other members of the racist organization known as the Black Liberation Army shot and killed police officers Waverly Jones and Joseph Piagentini after devising a plan to lure them to a Harlem housing complex with a false 911 call. Diane Piagentini says that she was forced to “rip open a scab” after the man who killed her husband in cold blood back in 1971 was released from prison, knowing that her husband would never return home again thanks to the disgusting homicide committed by the Black extremist Herman Bell. Officer Piagentini was shot a whopping twenty-two times as he lay inside the complex bleeding to death in an excruciatingly painful fashion, yet the radical liberal mindset of New York still decided to free his killers four centuries later in a shocking series of hearings that has infuriated both police officers and advocates for law enforcement across the nation. All three Black Liberation Army members, Herman Bell and co-defendants Albert Washington and Anthony Bottom, were convicted of murder and sentenced in 1979 to 25 years to life. The three men are monsters, racists, violent extremists, and cop-killers. Earlier this year, New York Democratic Party radicals took it upon themselves to grant Bell parole, and have since made an attempt to. free Bottom; after he expressed what he said was a “deep remorse” for the senseless slayings, and it created a nightmare scenario for the families of those killed. In April, the 70-year-old Herman Bell was released from Shawangunk Correctional Facility in Ulster County, New York, just around two hours north of New York City, where far-left liberal Democrats celebrated his freedom as if some type of hero had been released from prison. The New York City Patrolmen’s Benevolent Association, outspoken critics of New York City Mayor Bill de Blasio and the Democratic Party’s ignorance of the service of police officers, blasted the parole board for what it called both a gross miscarriage of Justice. There's also an active attempt to free the second murder suspect responsible for the senseless killings of two police officers, of which the PBA and the family of victims are remaining loud and outspoken to keep the radical racist cop killer behind bars. To make matters worse, there's the third effort in New York City to push for the release of another Black Liberation Army member, Robert Hayes, who shot and killed an officer for fifteen cents in 1973. The<a href="https://nypost.com/2018/06/21/new-york-is-freeing-another-cop-killer-from-prison/"> New York Post </a>reports that Hayes is will be paroled on July 24th, even after murdering a police officer. These are vile individuals, America. These are terrorists. This is what the Democratic Party’s bastion of disdain now supports, and protects those who murder police officers. "yet the radical liberal mindset of New York still decided to free his killers four centuries later"
Centuries!! Holy crap he has to be the oldest criminal alive! ;) He should be held for centuries or millennia. The article was first published exclusively in the New York Post, not the Daily News.